It took Becky Schimpff three months to make me a fireplace spoon. If she had worked straight through on it, from start to finish, she told me, it would have taken her half a day. 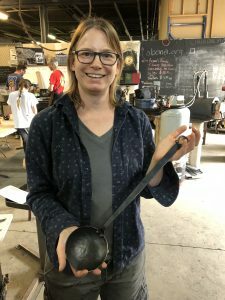 But Becky fit my request in with her other responsibilities, like raising two sons with her husband, Brian Kushnir, and volunteering 20-30 hours each week at Adam’s Forge, the non-profit iron-working workshop where she made the spoon. If you add the time it took her it took her to the length of time I’ve wanted one, you could say I’ve waited 34 years and three months for a fireplace egg-spoon. I first read about fireplace spoons in a Richard Olney cookbook, or in an article about a Richard Olney cookbook. I don’t remember which. But I read Olney’s Simple French Food in 1983, so it’s been a minute. Simple French Food was the first cookbook I read that went beyond recipes, that shows how you approach food shapes how you approach life. His aim wasn’t to teach American cooks how to make good food from a recipe. Julia Childs had already done that, and well. His book was a long lesson in how to make food part of your life. The recipes aren’t necessarily simple, even though many of the recipes have just a few ingredients. What was simple about it was how close the recipes and their ingredients were to the land and season where he lived. Now we think of that notion as a given. But when I read Olney’s book, that idea was just starting to appear in American restaurants, thanks to Alice Waters. And who was one of her major influences? Richard Olney. Olney wrote while living alone in his Provence farmhouse. He cooked many of his meals on a hearth fire, which he also lit to stay warm. To cook an egg, he would sometimes use the same fire, holding the egg at the end of a long copper and steel spoon. The image stuck. That sounded really good to me. I could picture just how that egg would taste. And starting then, I wanted an egg-spoon for my fireplace. First, I needed a fireplace. That took 10 years. Dating, marriage, apartment, house with fireplace. After that time flew. Career. Kids. Getting and spending. Other things to worry about. When I wanted to cook us eggs in the fireplace, I used a small cast iron pan, which worked perfectly well. I filed fireplace spoons under the category of Things It Would Be Kind of Cool to Have. At the top of the list: A Farm. Somewhere in the top 30, a fireplace egg-spoon. Then came an article a couple of years ago in the New York Times about fireplace egg-spoons. 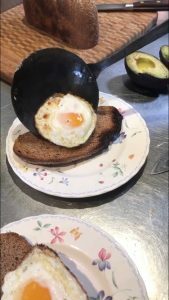 Food writer Daniel Duane had breakfast with Alice Waters, and she made him an egg cooked in a fireplace with an egg-spoon. Reader reaction went two ways. Most people decided then and there they had to have such a tool, and eventually Alice Waters’ daughter Fanny, who runs an online lifestyle catalogue, started featuring spoons made by a local blacksmith named Shawn Lovell. They cost $250 each, with 5 percent of the profits going top the Edible Schoolyards Project. At the same time, many people chided Waters for using all that wood just to cook breakfast for two. They thought it pretentious and wasteful. Me, I think the woman knew what she was doing. She knew that if Alice Waters made a fireplace egg for one food writer, it would be like cooking 200,000 fireplace eggs that will serve millions. Because that’s how many people eventually would read and be inspired by those two eggs. Is that worth the carbon dioxide emissions of a couple of small logs? Um, yeah. The Times story refreshed my desire. The $250 cooled it right back down. I Googled “blacksmith Los Angeles” and on the first page of results I saw a listing for Adam’s Forge, a non-profit 501(c)3 blacksmithing organization. What social need is there, I wondered, for an army of volunteer blacksmiths? Shoes for indigent horses? Even if they couldn’t sell me an egg-spoon, I was curious. I emailed. I asked if by any chance Adam’s Forge made fireplace egg-spoons. A woman named Becky emailed me back. Of course she knew about egg-spoons. She said it wasn’t something they did, and she wondered if I was the same Rob Eshman who had run the Jewish Journal. My mind flipped. A non-profit blacksmith organization whose female instructor read the Jewish Journal? I love love love LA. Becky offered to make me a spoon, which I thought was kind, but I didn’t plan to hold her to it. Three months passed. By then I had resigned myself to using the cast iron skillet technique, figuring my egg-spoon was no longer on Becky’s Things I Told Some Dude I’d Get Around to Doing List. Of course, I offered to pick it up. My wife Naomi and I drove to the Adam’s Forge studio in Glassell Park, a neighborhood of light industrial warehouses and middle class homes near downtown LA that is quickly gentrifying, like every other neighborhood near downtown. The studio is tucked away among cavernous buildings for Sony, Morgan Stanley and new media companies. You enter past a hand-painted sign and a storage shed that is filled with row upon row of steel hammers and tongs. Becky came out to greet us. She’s a young mom with short blonde hair and clear enthusiasm for the forge. She introduced us to her husband and two teenage sons, who were both taking part in the class on medieval knife making. Adam’s Forge was founded fifteen years ago as a memorial to Adam Leventhal, a devoted sculptor who committed suicide at age 42. Becky explained that the mission is to educate people on the craft of blacksmithing, advance it as an art form and grow the size of the community. Several volunteer instructors like Becky teach classes, which are booked months in advance. A History Channel series called, “Forged in Fire” which is the Iron Chef of blacksmithing, has created massive new interest in smithing. The show focuses on knives and weapons, which contestant forge and then, in a demonstration of their skill, use to slice into hanging animal carcasses. “You can’t believe how popular it is,” Becky said. This week, I watched an episode, and I can believe it. The world is virtual, robotic, mass-produced and stressful. We read the news and feel an abyss between the change we want to see, and the changes we are able to make. Sometimes what people need is to bang hot steel over an anvil or cook an egg over a log. The transformation is immediate and profound. None of it makes practical sense, but it feels really good. The studio is set up with a row of small forges down the center, each fed with a propane hose. Lined in firebrick, they look like mailboxes converted to pizza ovens. The idea is to concentrate and retain heat, about 2300 degrees of heat. In the midst of the tour, Becky presented me my egg-spoon. It has a concave, hammered-steel saucer riveted to the end of a 16-inch long steel rod. She rubbed the steel with beeswax for a black flat patina and seasoned the bowl in vegetable oil. At the very end of the rod she fashioned a curly-cue loop, called a rattail. “It is so beautiful,” I said. It was beyond my expectation. Becky wouldn’t take payment. She’s not in the business of making egg-spoons, since Shawn Lovell already does, and blacksmiths are respectful of one another’s turf. The next morning, I went online and made a donation to Adam’s Forge. Then I lit a fire. I used two small logs from some ficus tree pruning. I was cooking an egg, after all, not smoking a brisket. When the logs glowed red, I poured a bit of olive oil into the spoon, heated it over the flame, then cracked an egg into the center. It sizzled. The dry heat sent the white puffing up around the yolk as the bottom crisped. In a couple of minutes, I slid it onto a piece of toast. I made another, for Naomi. We ate them quickly, and they were delicious. My fireplace egg slipped onto homemade sourdough. “What’s the advantage of a fireplace spoon over the way you used to do it?” Naomi asked. I knew what she meant. For many years I’d been resting a small cast iron pan on the logs, campfire style, and getting the same effect. That enabled me to cook two or three eggs at a time. This technique was charming, beautiful, something on my bucket list, but less efficient. That’s when I realized: Olney lived alone. Sometimes he made an egg for a close friend or visitor, like Waters herself, but generally the egg-spoon was a practical solution to a meal when it’s just you and a fire. I realized that’s the image I had stuck in mind. That was the idea that had been so compelling to me I clung to it for over three decades. Me in a farmhouse, by a fire, making an egg. For one. Otherwise, an egg-spoon really doesn’t make a whole helluva lotta sense. That’s also, maybe, why I was never in a rush to get one. I cooked for family. I cooked for constant company. There was never just one for brunch. 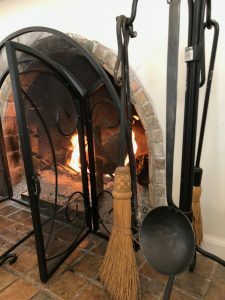 I hung my egg-spoon on the fireplace rack beside the poker and broom. It is stunning there. People will ask about it. I’ll explain that by the time I finally got my egg-spoon, my fantasies of living alone in a French farmhouse were way behind me. I suppose I’ll end up using it less for eggs and more to melt some cheese into a puddle for simple fireside appetizers, for a crowd.